c-Jun N-terminal Kinase (JNK) is a subgroup of mitogen-activated protein kinases (MAPK) that activate transcription factor AP-1 via the phosphorylation of c-Jun proteins. 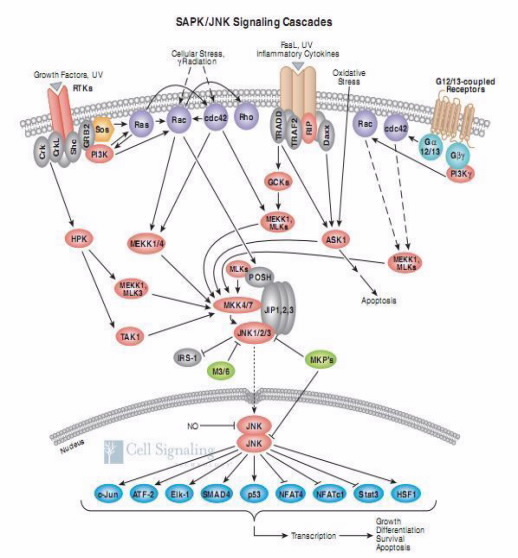 JNK is a responsive to stress stimuli component of intracellular signaling pathways that regulate cell proliferation, apoptosis, and cell differentiation. It is possible to split JNKs into ten isoforms derived from three genes: Jnk1, Jnk2, Jnk3 (Bogoyevitch,2006). The last one is found mainly in the brain while the first two are found in all cells and tissues. Alternate splicing of the gene transcripts results in further molecular diversity. A splice site within the Jnk1 and 2 transcripts results in two splice forms; a second alternate splice for all JNK transcripts occurs at the C-terminus of the protein resulting in the 46- and 55-kDa protein isoforms, capable of phosphorylating serine residues 63 and 73 in the N-terminal region of c-jun, thereby potentiating its transactivation function. JNK has numerous substrates but it is important to note in relation to c-jun in particular, that JNK remains the dominant kinase for c-jun in vivo; immunodepletion of JNKs from cell extracts removes all stress and cytokine-activated c-jun phosphorylation activity. Inflammatory signals, changes in levels of reactive oxygen species, Ultraviolet radiation, protein synthesis inhibitors, and a variety of stress stimuli can activate JNK. One way this activation may occur is through disruption of the conformation of sensitive protein phosphatase enzymes; specific phosphatases normally inhibit the activity of JNK itself and the activity of proteins linked to JNK activation. Ischaemia is a stress condition that triggers signal cascade activated by JNK leading to neuronal death. Recent studies identified the c-Jun transcription factor and Caspase-3 as the main elements involved in JNK-mediated neuronal death pathway (T. Borsello et Al.,2003). These experiments showed that a synthesised D-retroinverso JNK inhibitory form has prevented the interactions between JNK and its targets. D-JNKI1 was created binding the 10-amino-aicd HIV Tat(48-57) transporter sequence to the 20-amino-acid JNK-binding motif of JNK-interacting protein-1/islet-brain 1 (JIP-1/IB1). Other studies showed that D-JNKI1 reduced neuronal cells loss both in transient and in permanent middle-cerebral artery occlusion. A temporal monitoring of the activity of D-JNKI1 and of its direct activators MKK4 and MKK7 – kinases showed that the best neuroprotective effect is in a 6-12 h time window after an ischemic event (M. Repici et Al., 2007). Fig. 2: The ischaemic penumbra. Example of an ischaemic effect. A brain region of low perfusion in which cells have lost their membrane potential terminally (‘core’) is surrounded by an area in which intermediate perfusion prevails (‘penumbra’) and cells depolarize intermittently (‘peri-infarct depolarization’). Perfusion thresholds exist below which certain biochemical functions are impeded (colour-coded scale). (U. Dirnagl et Al.,2007). D-JNKI1 cell penetration capability in the brain of controls and ischaemic P14 rats has been tested using FITC-labeled D-JNKI1. The fluorescent peptide can cross the blood–brain barrier (BBB) and penetrates cortical neurons of P14 rat within 1 h following intraperitoneal injection (U. Dirnagl et Al.,2007). Fig. 3: D-JNKI1 penetration in the brain tested using FITC-labeled D-JNKI1, which penetrates cortical neurons of P14 rats within 1 h from i.p. injection (A). In ischemic rats the peptide is still able to cross the BBB and concentrates in the ischemic region (B). Scale bar = 50μm. (M. Repici et Al.,2007). These results can lead to interesting therapeutical applications of this peptide in some neurological deseases.